Startups today are growing faster than they have in the past. US VC backed startups in 1998 grew revenue 63% per year on average. 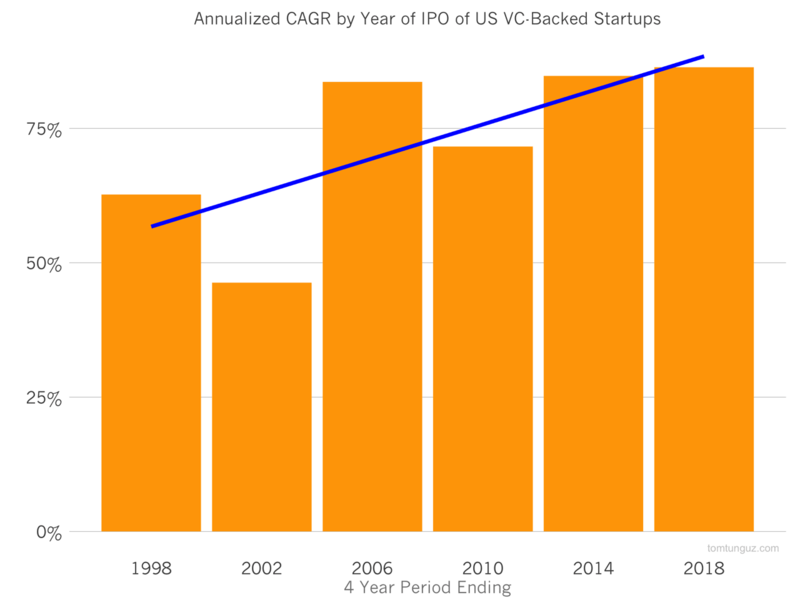 In 2014, the median startup grew at 85% CAGR before going public. 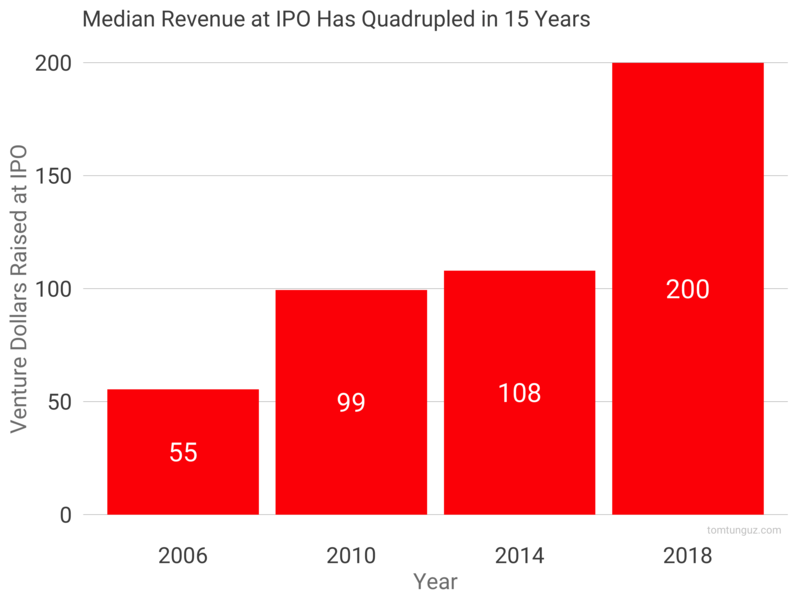 More impressively, newer startups must be 5x larger than 15 years ago before going public. In 1998, the median IPO-bound startup reported $11.8M in revenue in their S-1 (inflation adjusted dollars). In 2014, a startup needed $54M. Withthe two venture backed IPOs though August 1, 2015, the trend shows no signs of abatement. These increasing growth rates are fueled by three key trends. First, the acquisition channels startups use to acquire customers address many more potential customers and enable far more cost effective marketing than twenty years ago. Second, purchasers of products, both consumers and enterprises, are much more inclined to purchase products from startups than ever before. Third, the private market investors are willing to invest in high-growth startups despite the greater losses sustained during most rapid growth. It’s not uncommon to hear startup marketing departments speak of acquiring customers on Facebook for a few dollars. But equally importantly, these marketing teams can acquire tens if not hundreds of millions of users before exhausting the acquisition channel. And in addition to Facebook, there’s LinkedIn, mobile app stores, enterprise app stores, content marketing, and a host of other customer acquisition techniques not employed 20 years ago. This quiver of options means the limiting factor for marketing teams often is cash. Because buyers are increasingly predisposed to try new products, the unit economics of these campaigns often work well, and so it’s a question of spending more to make more. Also, subscription revenue models have become broadly adopted in enterprise and some consumer segments, which provides revenue predictability. So, a startup can invest a lot of money today to generate 3x or 5x as much revenue over the customer lifetime in the next few years. In such cases, cash is the main limitation. Fortunately, VCs are investing at potentially unprecedented rates, providing startups the cash needed to acquire as many customers as possible, even if the profitability suffers. Because many industries operate with winner-take-most dynamics, the startup that grows the fastest will raise the biggest round, will be able to grow faster, and consequently, will be able to raise more money at a higher valuation than its competitors. If the unit economics of this game are sound, then this is a terrific bull market business strategy. If on the other hand, the unit economics have yet to be proven, it’s a game of chicken among the competitors. How deep in the red are you willing to go, to achieve best in class growth rates? As a consequence of these three trends, startups are able to grow faster than ever before. And we are seeing new records set each year. The fastest social network to 100M users, the fastest software company to $50M in annual recurring revenue, etc. We also see some companies burning through hundreds of millions of dollars only to shutter. That’s the double edged sword of fast money.